Most Millennials have heard of Tulum or seen the beautiful travel posts on Instagram. 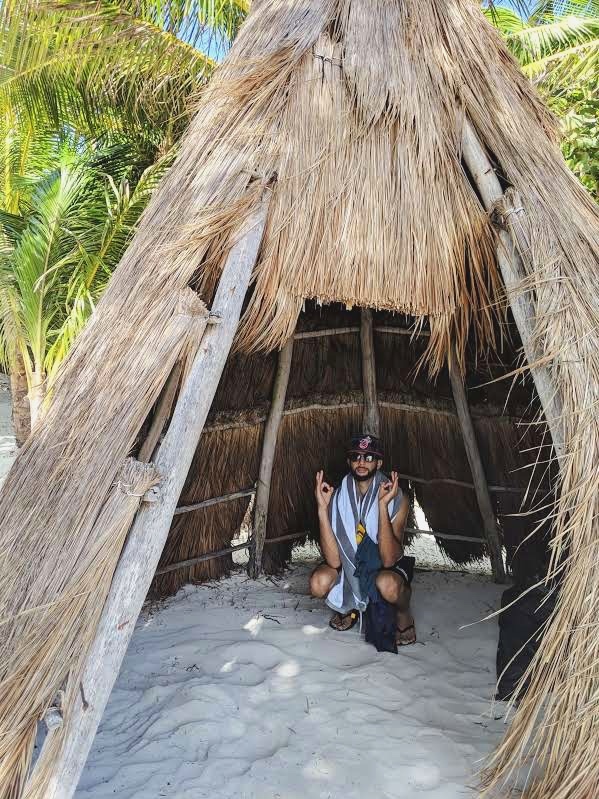 The trendy, New York-ified yoga town sits 90 minutes south of Cancun, so we rented a car and headed straight to Tulum from the airport. Tulum’s town is referred to as pueblo and the beach as playa. Some may be put off by the fact that the town center, where the really cheap eats and sleeps are found, sits right on the highway, making the main drag feel more like a truck stop than a tropical paradise. But rest assured that if Tulum’s pueblo isn't to your liking, you can always head to the coast and find that tranquil, beachside bungalow. It’s not big high rise resorts but instead perfectly designed boho-chic-eco-yoga places serving matcha and kombucha. Before checking in, we stopped by Tulum’s 1,000 year old ruins, but surprisingly it's not the Mayan influence that inspired most of the tourism. Tulum's New Age vibe, jungle-shrouded restaurants and white sand beaches have made it Mexico’s Yucatan Peninsula hottest spot. Arrived to Tulum, after an hour drive from the airport, and slept in the first day here 😂 (just getting over my cold) so here's Day Two. 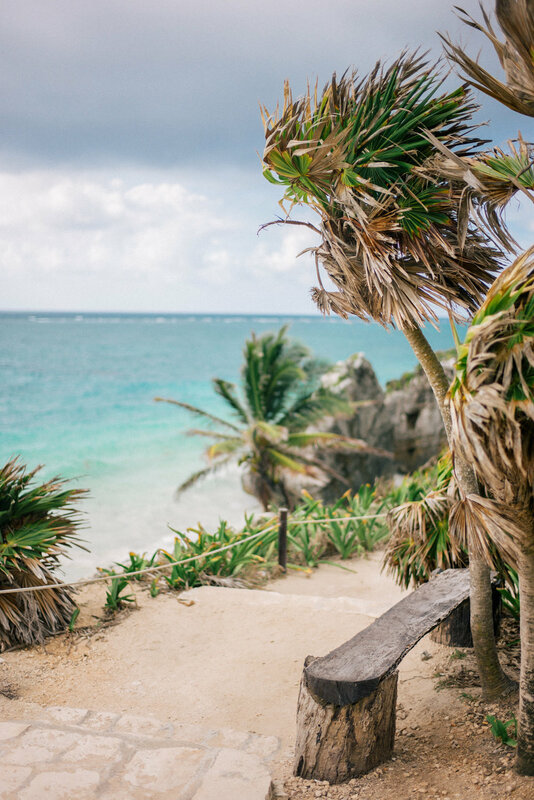 The Tulum Ruins are the “thing to do” in Tulum. They are Mayan ruins that overlook the sea, and it truly is breathtaking. While Chichen Itza is where you see the big pyramid, it’s unique to see the ruins as the only Mayan city built on the coast! Plus it’s 10 minutes away from the pueblo and playa. It was 100 pesos for parking and entrance fee is 80 pesos. Arriving mid-day we had no idea what beauty lay before us as we maneuvered our way along the coast of Mexico. After a very long day of travel and sightseeing (hungry and tired) we stumbled across a restaurant and set course for lunch at Nomade. The decor at Nomade was probably my favorite of any hotel that we wandered onto. I loved the Moroccan vibes with the rugs, low tables and bean bags for sitting in the restaurant. Our lunch did not disappoint, there’s nothing quite like a fruit platter when visiting somewhere tropical like Mexico. With our bellies full, found our way back to our airbnb and fell into bed, until dinner that is. Hartwood the most sought-after restaurant in Tulum, their menu changes daily and celebrates fresh local ingredients. If you want to dine there, you better be quick and make a reservation one month in advance — so we didn’t go there, instead we went right next door to the perfect open-air jungle spot, Gitano! We went on a Friday night and Gitano turns into quite the party, but with dinner reservations you won’t have to wait in the long line of people entering to dance. I highly recommended the Jungle Fever! This trendy, jungle-enclosed restaurant/cocktail bar is worth a visit. 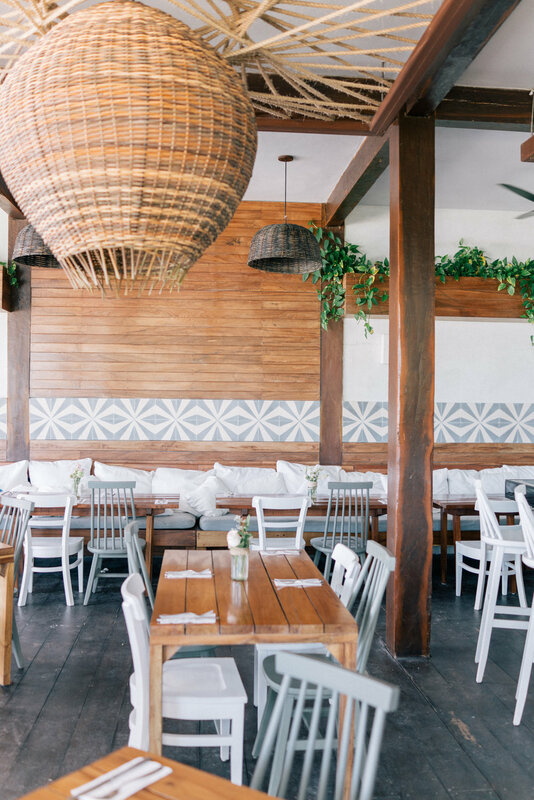 We tried Papaya Playa Project for lunch, this buzzing beach club and restaurant serves up delicious fare in a gorgeous beach setting. The semi-ampitheatre’s seating was my favorite part, but there is also and overhanging double-story beach bar. The restaurant is alongside the beach, with tables set into a slope for optimal water views. The food here is all made with organic produce, so we felt super healthy eating it. The atmosphere was so calm and beachy, it’s hard not to feel completely relaxed and blissful. We ate with a view of the ocean waves, so after lunch we headed down the stairs to Tulum Beach. With a view of that white beach and the beautiful blue water, it’s hard to resist the ocean. Leave your flip flops at your beach bed (there is a minimum for food/beverage, but you can choose to have lunch there), grab your sunnies and walk until you’re ready to come back. Dip your toes in the water, swim back or turn on your heels and walk all the way back until you hear the DJ playing on the beach. We went Saturday, which is when Papaya Playa Project is known for its beach club parties and international DJs. But we stuck to walking down the breezy sand, finding a couple of swings and breathing in relaxation — and after nearly passing out on the beach, we headed back to our airbnb and watched movies until dinner. We absolutely had to finish ‘The Proposal’ so we went a little late in the evening for dinner (around 10pm) and walked into Beso. It's not on the beach but it is gorgeous inside, I could hear Abd-Allah laughing as he said “of course you’d find a place like this” — I took it as a compliment (lol). The food is definitely eccentric, a very ‘foodie’ kinda spot. Which I enjoyed, but if you like big meals like Abd-Allah then it might not be the best place for dinner. As the night progressed they had live music start to play and guests got up group by group to dance (even the staff danced). We started our day at sunrise, and made our way to an 8am yoga class at Sanara ($20pp), in a beautiful ocean front studio. After finishing up our morning yoga, we decided to stay and have breakfast at the hotel’s restaurant called The Real Coconut. Everything on the menu has some kind of coconut in it and it’s all incredibly healthy and delicious. A great start to our early morning was followed by some exploring of Casa Malca — also known as Pablo Escobar’s mansion. Though there are few traces of its past left now, this luxury hotel on the coast of Tulum was once a mansion owned by Colombian drug king-pin Pablo Escobar. The hotel leads out onto a long stretch of beach, surrounded by lush rain forest. The artsy photo and the BTS photo. Probably the most amazingly-unusual hotel in Tulum, if not all the world, this work of art is a photographer’s dream. Azulik defines ecoluxury and “Instagram sensation.” The hotel is can be a bit pricey, but visitors are allowed into the IK Lab gallery and Kin Toh restaurant. Their space IK Lab has wave-like cement walls and undulating vine floors, making it a spectacular and unusual backdrop. It’s more than a gallery, it aspires to be an interactive visionary architectural space. Azulik’s jungle treehouse restaurant is a must see. Guests are allowed into Kin Toh right before sunset dinner. I made sure to make a reservation on OpenTable ahead of time, when we arrived the overflow of guests were being asked to wait on the side because the restaurant was booked. Once inside you are surrounded by beautiful trees, the sound of the birds, and breathtaking views of the sunset. The decoration and details makes you feel like you are walking into a dream. Wooden floors and wooden bridges that lead you to open areas; the bar and restaurant. The spaces with hammocks suspended between the trees were my favorite part. 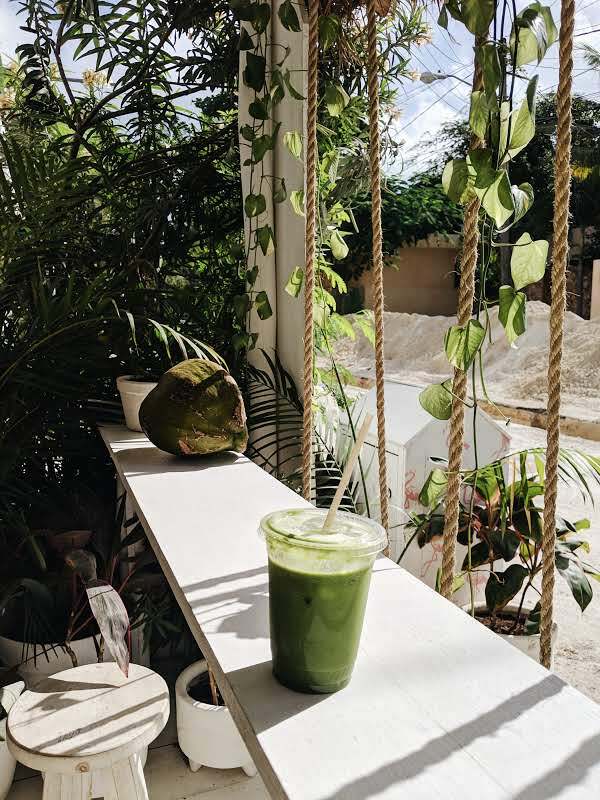 I love Tulum so matcha. We woke up early with plans to grab some breakfast at Matcha Mama and do some cenote swimming before heading to the airport. After scouting some locations, we were between Gran Cenote, Dos Ojos Cenote and Cenote Cristal. 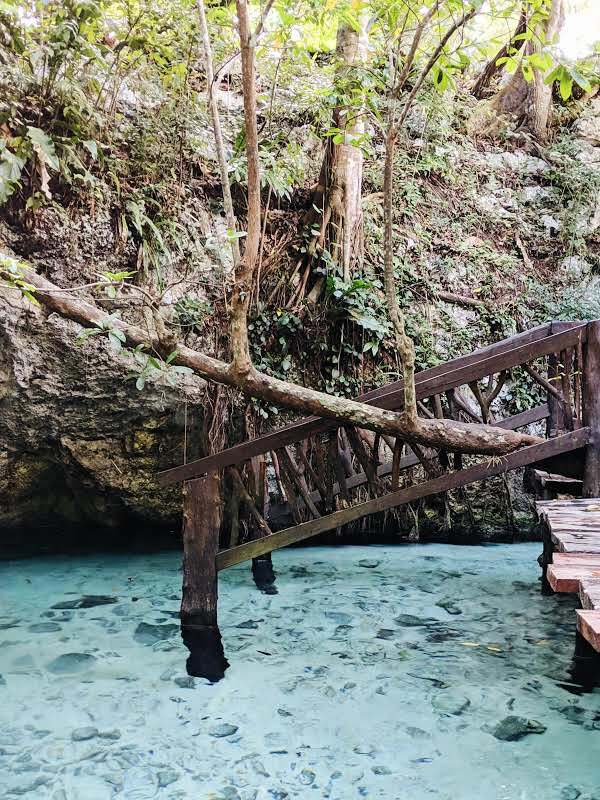 We went to Gran Cenote, palm trees and tropical plants grow along the water’s edge, with clear blue water. The color of the water is so clear that one can see fish swimming without even snorkeling, but it is one of the most popular spots to snorkel (there is rentable gear). Quick stop at Starbucks before the drive to CUN airport, thus ending our amazing trip in Tulum. 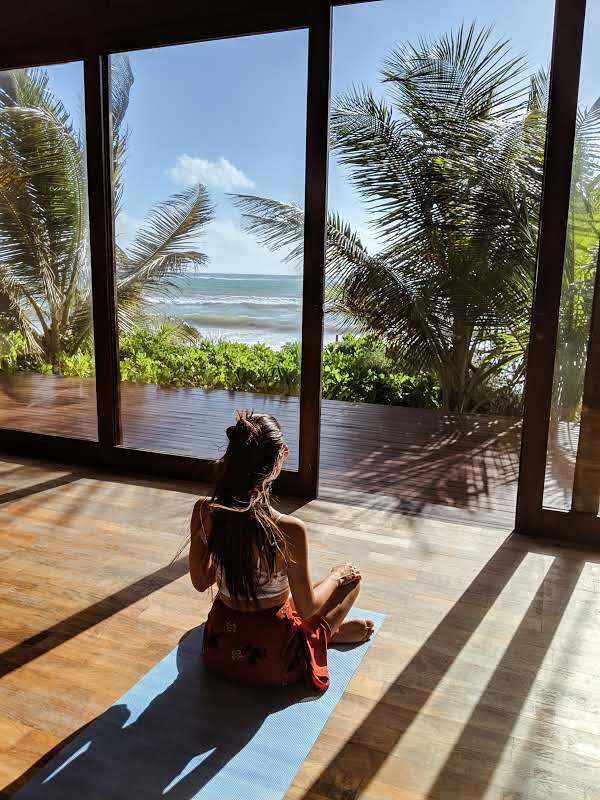 Yoga at Sanara: $20pp for an hour beachfront session. We chose to stay at an AirBnB in Tulum’s pueblo, with a car rental it made it easy for us to drive to and from different spots along the beach. We rented our car from EuropaCar — They provide a shuttle service to/from the airport to/from the rental facility. If you are uncomfortable driving, there are taxi cabs and car services available. There is no Uber in Tulum but taxis are plentiful and pretty easy to flag down. Parking in Tulum was fairly easy. Though the beach road strip is a little tight to drive through, there are parking lots all around (average 100 pesos) but we were able to park for free since we dined at almost every location we went to. English is spoken but not as widely as you’d expect for such a tourist town. It’s helpful to brush up on your Spanish!